When you have a tube amp - you have spares and even expensive rare tubes. You need to protect these tubes from everything the world can throw at them. 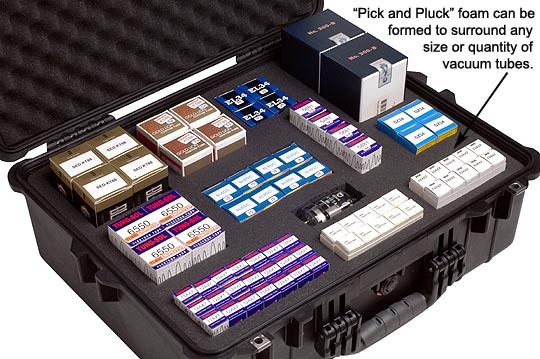 Large enough to hold 8-12+ quads of power tubes and 40-60+ preamp tubes or just about whatever else you want to protect, the TubeCube Pro is the ultimate way to protect your sensitive tubes and gear. Unbreakable, watertight, dustproof, chemical resistant and corrosion proof - These are some of the features of this Pelican made TubeCube Pro case that offer total protection for your tubes. It is made of Ultra High Impact structural copolymer that makes it extremely strong and durable. Its exclusive 1/4" (6.4 mm) polymer o-ring and ABS latches seal perfectly and includes an automatic purge valve for quick equalization after changes in atmospheric pressure. With the "pick and pluck" foam you can easily customize the inside of your case. Your tubes can fit into the high density foam of the case for total subjection to and protection against impact, vibration or shock. This case is NATO codified and tested to IP-67 (Ingress Protection). You break it, we replace it... forever. For more information on this case (Case # 1600) and other Pelican products, see the Pelican website. If you order tubes or other parts that will fit in the TubeCube Pro, we can ship your order in the TubeCube Pro. For us to do this, you have to order the parts and the TubeCube Pro. In the comments section tell us that you want us to ship the order in the TubeCube Pro and we will take care of it. Size: 21.43" x 16.50" x 7.87"